We’ve been conducting a mince pie survey over the past couple of weeks. I love mince pies, and someone on twitter (I think) said that their goal was always to try a dozen different mince pies each year. A motley bunch. Surprised to see Sainsbury’s in there, but their pie filling was fairly bland and dull. Most surprising was the M&S puff pastry one – these looked AMAZING out of the box, big fat pies which looked like scones. Bite in though, and they were all air. The puff pastry was a bit… claggy too. Filling was nice, and when one pie top came off leaving a mince pie tart, they were quite nice. Lost points for being all puff and no pie. Now we’re getting serious, and moving into the big league. The four-star pies. The M&S cafe one was really rather nice. It was a tart-style pie, really thin pastry, a very tasty filling and a great crumble topping. Let down by costing £1.75, though you did get a dollop of cream to go with it. Another home-made pie in the list, great filling, nice pastry. Sainsbury’s baked in-store were very good, apparently, and at only a quid for four, good value. The Cooplands pie was very nice, and had a dollop of brandy cream on top of a tasty filling. Well worth a try, but twice the price of the Sainsbury’s ones. And, last but by no means least, the only five star pie in the bunch. I confess that I got this free with our veg box from Abel & Cole. 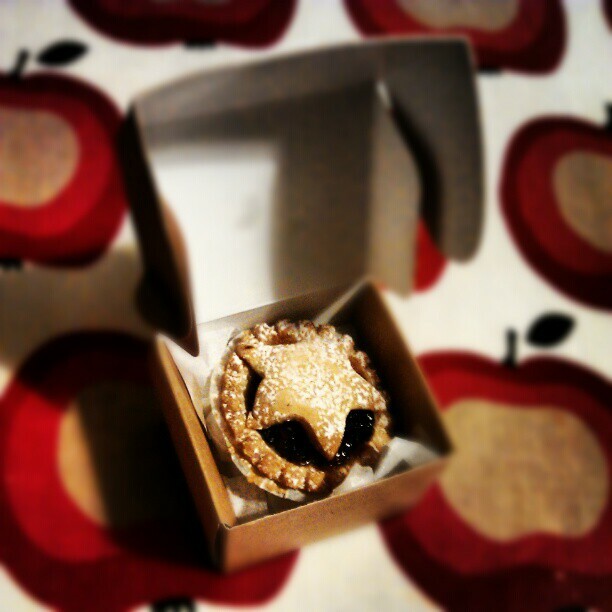 It’s a small pie, but came beautifully boxed and was quite delicious. It had almonds and cognac in, and had by far the best taste of all the pies I’d tried. Great pastry too. They seem a bit expensive, at a fiver for 12, but when you look at something like the M&S puff pastry ones at £2.60 for six (and not very nice), they’re more than worth it. Next year we’ll be a bit more organised and mark on pastry, filling, cost per pie etc. I can feel a colour co-ordinated spreadsheet coming on! I also planned to try some more indie shop pies, but haven’t managed to get that sorted. So, have you tried any mince pies this year? Report back! Mince pie flavoured chocolates? Yum! Mmmm those cooplands ones with brandy butter are blumming lovely, am going to pick myself some up as a treat tomorrow! Did you try a Greedy Pig mince pie this year? They were very lovely, definitely one to add to the list for next year!